6-IN-1 USEFUL SKIN CARE TOOLS: 6 Different sized needles, loops and tweezers effectively help handle all types of blemishes and bumps, blackhead, acne, comedone, pimples and zit. BLACKHEAD TWEEZERS: The aligned straight and curved tweezers work better on place that hard to reach than loops. Both tweezers are razor sharp, be gently and careful! 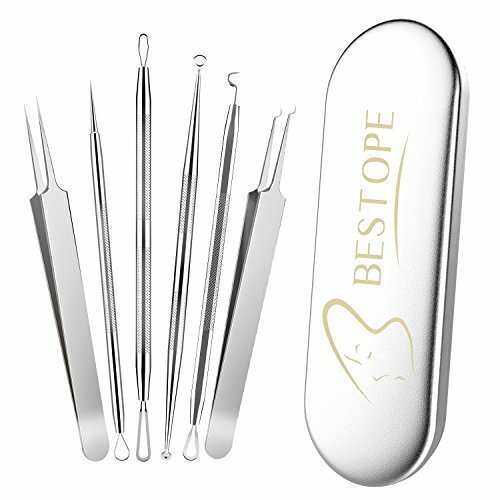 100% STAINLESS STEEL: All these blackhead tools are durable with stainless steel, clean and safe. ERGONOMIC DESIGN: Ergonomically Shaped tools and Anti-slip handle to help you better control the pressure and get a secure grip during use. PACKAGE AND PRECAUTION: Individual metal case is safe and convenient for storage and transport. Be gently during use and don`t use any blackhead remover tool before the acne matured, user manual included.